"Our job is selling miles," says Shai Agassi, founder and CEO of Better Place. DETROIT -- Shai Agassi has a grand vision. 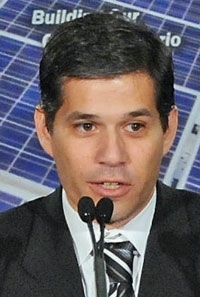 By 2012, he says, a new class of moderately priced electric vehicles could cruise on U.S. roads. Agassi is founder and CEO of Better Place, a California startup whose plan to promote electric cars has won the backing of French automaker Renault SA and others. In the Better Place model, automakers sell electric cars at relatively low prices because consumers don't buy the vehicles' lithium ion batteries. Instead, Better Place owns the batteries, which are swapped in and out of the cars as needed. Better Place sells consumers plans, similar to cell phone contracts to buy services, including access to power, by the mile. "We buy electricity. Our job is selling miles," Agassi told Automotive News. "We're the new gas station network." Agassi insists that with switchable batteries, a U.S. carmaker could put an electric drivetrain in a high-volume mid-sized vehicle and sell the car for less than $20,000, not including tax incentives. The company also says it can solve the problem of where and when drivers can charge vehicles. It would use a combination of charging spots installed at homes and workplaces; robotic battery-swapping facilities -- similar to gas stations -- for drivers taking longer trips; and smart-charging software installed in the vehicles. In September, Better Place signed a deal with Renault to import and distribute 100,000 Fluence ZE switchable-battery electric cars in Israel and Denmark. It has agreements with companies in Israel to lease 40,000 vehicles for their corporate fleets. The company has installed more than 1,000 charging stations in Israel and 100 in Copenhagen. Better Place will launch its first battery-switching station in Tokyo next spring. The station will be used in a pilot program involving electric taxis. Agassi hopes to tackle the U.S. market in 2012, starting in San Francisco and Hawaii. He said the premise of Better Place is that people will choose alternative cars if they are moderately priced and convenient. "We've always asked the driver to pay more for a less convenient car and then said, 'Oh, by the way, you'll save money on the mile,'" Agassi said. "So the question became: Can you make an electric car that would be more convenient than a gasoline car?"